Viking ranges bring the power and versatility of commercial cooking into the comfort of your home. Viking's timeless styling not only accents cabinets, stone, and tile, but the classic appeal creates an inviting and warm, open concept kitchen. The Viking range company was the first brand to introduce professional-grade stoves to the residential market in 1987. Viking was also the first to manufacture appliances in a variety of colors such as mint green, apple red, and cobalt blue, spearheading a design movement that offered a rainbow of color choices. Viking's success faded after 2008 due to multiple product quality issues and safety recalls. Luckily, Middleby Corporation acquired the brand in 2013. It took Middleby, a technology leader in commercial kitchen equipment 5 years and a sizable investment in re-engineering the line and achieving the superior quality levels expected from ultra-premium appliances. Today, Viking ranges come with an industry leading two-year bumper to bumper warranty along with a five-year limited manufacturer's coverage. With this level of quality assurance, you can really enjoy designing what you’d like to see in your kitchen. Are you ready to cook in color? Their elegant burgundy range pairs beautifully with marble countertops and aged brass fixtures adding a classic and customized European look. Cobalt blue, which became a signature color for Viking, offers a pop of interest to the kitchen space - serious cooking for serious entertaining. Apple red is a bright and bold statement, experimental culinary adventures not for the faint of heart. Whether you choose classic stainless or one of Viking's signature colors, these ranges are highly sought after by home chefs who rely on their power and temperature accuracy to create deliciously crafted meals. PRO TIP - Make sure to contact our staff at (888) 714-4938 to inquire about savings on Viking Range packages. Most people wonder what a range vs. a stove vs. an oven means. In spoken language, we often use these three terms interchangeably. 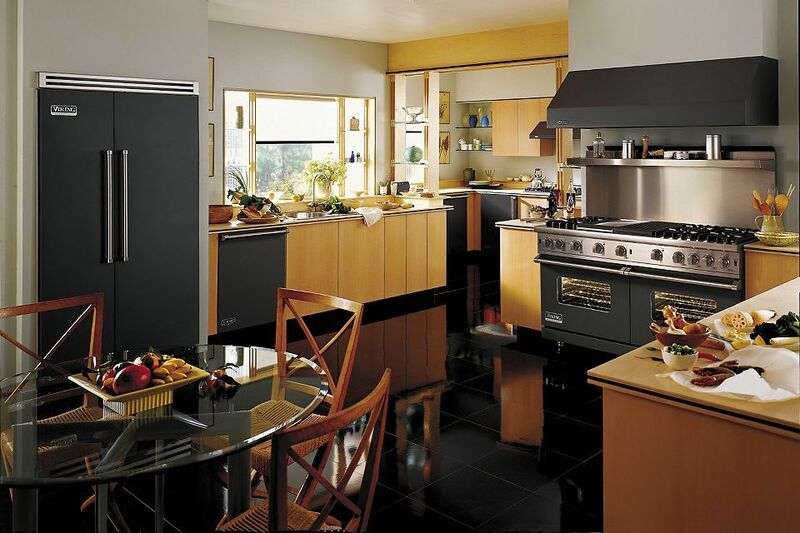 In the world of appliances, a range combines both an oven and cooktop/stovetop. The picture below will help visualize distinctions. Viking ranges come in 30-inch, 36-inch, 48-inch, 60-inch, and 66-inch width options. It’s a good idea to measure your kitchen in order to figure out which size is best for you. 30-inch and 36-inch ranges are the most popular sizes and provide a wide variety of cooktop and oven combinations. If you are looking for a range with plenty of flexibility, one of these products could be your ticket. Want to live a baker’s dream? Check out the 48-inch and 60-inch ranges. These stoves come with a double oven and have tons of capacity for all the goodies you want to bake. The cooktops typically come with a griddle by default, and there are a wealth of options for customization based on how and what you like to cook. What are the different fuel types? Viking ranges come predominantly as all gas or dual fuel (i.e., dual-fuel means gas cooking surface and electric oven). Viking also has a small selection of electric and induction ranges. Most people prefer Viking's electric ovens (i.e., the dual-fuel ranges) as they help control the heat more precisely compared to that of gas-powered ovens. In an all gas oven, the heating element kicks in to reach the right temperature but maintains the temperature by turning itself on and off. These oscillations may actually vary the temperature in the oven cavity. More importantly, the self-clean feature found in electric ovens is much more desirable. As far as the cooking surface goes, Viking offers gas, electric and induction. A gas flame cooking surface is by far the most popular choice by Viking customers. It is what Viking is known for, and you will find the flame ultra responsive. Electric burners still have advantages though! A smooth stove top surface is easy to clean. Induction cooktops, on the other hand, feel a little like magic. They use electromagnetic energy that heats only the surface of your pan. Induction surfaces boil liquid the fastest and respond immediately to very precise temperature changes. With Viking, there are plenty of options to customize your cooktop based on how you like to cook. For example, if you frequently grill meat, fish or vegetables, a range with a grill is clearly the way to go. If you’re all about pancakes, burgers, or French toast, you should pick up a cooktop with a griddle. If you have a large family or you often cook different meals at the same time, think about double-oven systems and larger cooktops with more burners. These optimized configurations are found on 48-inch ranges. Viking ranges feature both open burners as sealed burners. Open burners deliver the flame directly to your pan giving you intense cooking power. But open burners have a disadvantage: cleaning. Open burners must be cleaned more often because spilled food may clog the burner nozzles. Sealed burners have a small cap on them which causes the flame to swerve around thus avoiding spillage on the burner nozzle. (3) How important is convenient cleaning? Electric and induction cooktops have a smooth, easy-to-clean glass surface. As long as you are careful not to drop or scrape heavy objects on the glass surface, these cooktops will resist scratches. Gas has the advantage of more precise burner temperature. Although it’s not fun to scrub clean burners and the pan area under the grates, a useful feature is that all Viking stoves have a durable porcelain finish that resists food stains. Viking ranges have the new "Elevated Burners", and the VSH (VariSimmer™-to-High) make cleaning less of a chore. Most dual fuel ranges and select gas ranges come with a self-cleaning feature. The self clean cycle takes a couple of hours and helps pulverize and vaporize grease build up. All you need to do is wipe up the ash debris after the self-clean cycle is complete. There are 4 different types of Viking ranges. After reviewing the different models, we believe that Viking drew inspiration from the BMW automobiles when coming up with their naming scheme. The entry-level 3 Series presents the 30” range with the different fuel types. The 5 Series offers 30”, 36”, 48” and 60” professional ranges and all the standard features. The 7 Series is the top of the Viking line and uses premium features on the 36” and 48” models. Finally, the Tuscany Series combines premium materials, top-notch features, and an iconic Italian Design. VariSimmer™: Low-level simmer is standard on all Viking stove burners. Precise low heat settings evenly melts chocolate and simmers food without burning it. Rapid Ready™ Preheat: Do you get impatient while waiting for your oven to heat up? This time-saving option found on dual fuel 5 and 7 Series ranges allows you to preheat the oven quickly by utilizing the power of both the bake and the infrared broiler elements. The VSH (VariSimmer™-to-High) Burner: The Pro Sealed Burner System helps you enjoy cooking the best meals of your life with precise temperature control, and a powerful TruPowerPlus™ 18,500 BTU burner. Thanks to the unique surface design, this cooktop is easy to clean. Viking nomenclature gets a bit confusing as they refer to the same high functioning burner as VSH, VariSimmer-to-High and as TruPowerPlus. SureSpark™ Ignition System: SureSpark system is designed to eliminate frustration. It provides reliable ignition at the first spark. In addition, if for any reason your burner goes out while cooking, this system will automatically re-light. All Viking gas and dual-fuel ranges share this technology to make your cooking experience as seamless as possible. Self-Clean: Who likes cleaning the oven, really? This feature burns spilled and baked on food debris using a high-level of heat. After the cleaning cycle, all you need to do is wipe away any residual ash. Elevation™ Burners: These high quality brass burners are found on 7 Series ranges. Viking's elevation burners boast 23,000 BTU output. Viking also makes 15,000 and 8,000 BTU versions of elevation burners so you can use different cookware sizes. Elevation burners are raised up about 2 1/2 inches from the porcelain surface. This helps keep the cooktop surface cool (preventing baked on spills) and allows access under the burner for easy cleanup. GentleClose™ Door: This option ensures that your oven door always closes gently and silently. This well-thought-out detail showcases Viking’s attention to ergonomic luxury. QuickCook™ Surface Elements: Are you an impatient chef that wants to roll up your sleeves and get started right away? Electric cooktop burners reach full power in just 3 seconds. MagneQuick™ Induction Elements: This is an excellent choice for those who want to save energy and cook with optimized precision. Induction elements react with the iron in your cookware, transforming your cookware it into a powerful vessel that heats quickly, responds precisely, and is incredibly efficient. TruGlide™ Oven Rack: Full extension racks offer safer and easier removal of heavy bakeware. This is an excellent feature that will make your life easier if you bake often. iDevices: Like new tech? This feature allows you to monitor your food temperature from up to 200 feet away via Bluetooth and an Apple or Android device. ProFlow Convection Baffle: Viking’s fancy way of saying the air movement generated by a convection fan is channeled in multiple ways so you can bake bread and cakes faster and evenly. TruConvec™: An exclusive air circulation system in Viking convection ovens. TruConvec uses only the convection element in rear of the oven versus using direct heat from a fan at the top or bottom of the oven cavity. This gives you maximum control and helps you bake to perfection. Vari-Speed Dual Flow Convection System: This extra large convection fan gives you maximum control. This fans can turn both directions and can operate at different speeds for maximum airflow and versatility. All models are freestanding and have a 30-inch width. They come with the SureSpark™ Ignition System, self-cleaning, and a grate design that allows for smooth movement of pots and pans. Gas Cooktops have 5 permanently sealed burners, giving you a good amount of options to meet your needs. The electric cooktop comes with an easy cleaning ceramic surface, as well as the QuickCook™ feature. The oven features 6 rack positions, and the TruGlide™ Oven Rack and Vari-Speed Dual Flow™ Convection fans which are standard. These are the most popular models in the Viking catalog. The fantastic “free dishwasher with purchase” promotion starts with the 5-Series ranges making this package more economical than the entry level 3-Series ranges. Viking's Professional 5 Series also features a limited number of electric and induction ranges. This option comes with a 30-inch width MagneQuick™ induction elements that instantaneously transfer heat to your cookware. This range has the largest electric convection oven on the market and features Viking’s ultra-premium functions like the Vari-Speed Dual Flow Convection Cooking and Rapid Ready Preheat System. This 5 Series Range features a standard 30-inch width. Their proprietary 24-inch deep oven design boasts one of the largest oven capacities available. This is one of the only professional, all-electric ranges built for the home. The electric cooktop has QuickCook™ surface elements while the induction cooktop has MagneQuick™ induction elements. Both the electric and induction cooktops come with the Vari-Speed Dual Flow™ convection system and rapid ready preheat. The hidden 10-pass dual bake element provides precise temperature control and, of course, this option comes with a self-clean cycle. Combining Italian design with Viking Professional performance, the iconic Tuscany range captures the heart of Italy. This dual-fuel range comes in 36, 48, 66-inch widths and has a beautiful heavy door, thick grates, die-cast metal knobs. You will also get a decorative storage drawer as part of the Tuscany design. Here you'll get high-performance (20,500 BTU) brass burners that make the cooking process more efficient. The electric griddle and induction elements combine with gas burners in the 48-inch and 66-inch models. You can easily customize the cooktop to best suit your needs. The high powered oven functions are similar to that of the 7 Series dual fuel ranges. Trough". No need to reach for your dictionary. The “Griddle Trough” is where grease and debris from the griddle accumulate making cleanup quick and easy. Customize your range hood, dishwasher, other custom panel appliances as well as your cabinet doors with the versatile Tuscany colors, knobs and handles. All in all, this range exemplifies extraordinary pride and workmanship making it a statement for any exquisite kitchen setting. This iconic and home-grown American brand deserves a second look. Middleby Corporation streamlined products and improved quality which go a long way to ensuring customer happiness. However, with the engineering side of things in order, Viking may benefit by relaunching their website and publishing consistent documentation. It may also be a good idea to further clarify the distinction between the 3, 5, and 7 Series. We hope this article has given you a deeper understanding of the features and options that this re-engineered and streamlined range offers. From second look to a serious contender, we believe you will love cooking on the new Viking range.